Despite continued growth during the last ten years and a benign outlook the level of building activity seen in the 1990s has not been reached again. 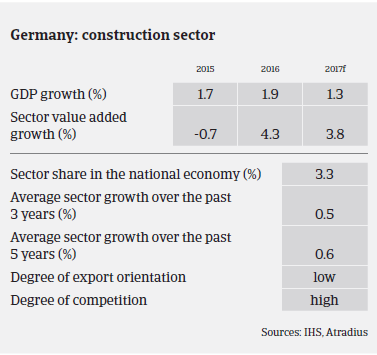 In 2016 the German construction sector continued its solid performance. The outlook for 2017 remains positive, mainly driven by another surge in residential construction. According to the German Builders Association, turnover growth will increase 5% in 2017, to more than EUR 112 billion. Residential construction is expected to increase 7%, driven by a high employment rate, low interest rates and the need to provide new housing for the large number of refugees and asylum seekers. Public construction is expected to increase 5% due to increased investment in infrastructure, while commercial building output is forecast to grow 3%. However, despite continued growth during the last ten years and the benign outlook, the level of building activity seen in the 1990s has not been reached again. The sector´s share in the national economy has decreased to about 3%, down from more than 6% in the mid-1990s. Within the industry, 90% of companies are small businesses (less than 20 employees) accounting for 45% of total construction turnover. 45% of sector turnover is realised by companies with 20 to 100 employees, and the remaining 10% is generated by large companies with more than 100 employees. Small companies are mainly focused on residential construction (about 70% of operations), while large building companies generate most of their turnover abroad. On average, payments in the German construction sector take around 45-50 days. After decreasing in 2015, instances of payment default remained stable in 2016, and this trend is expected to continue in H1of 2017. With demand increasing and profit margins improving, construction insolvencies have decreased in recent years (down 2% in 2016) and are expected to remain stable or show a modest decline in 2017. 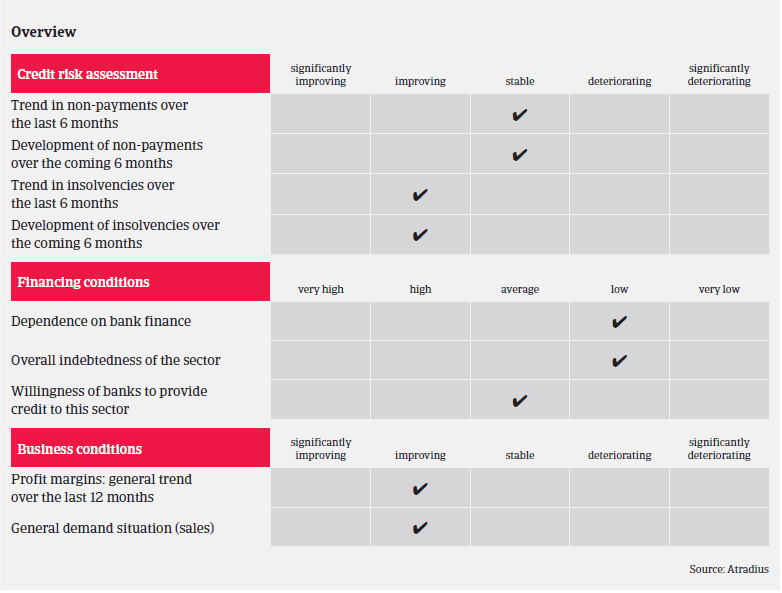 Construction businesses´ dependence on bank finance is not overly high, given that payments in advance or instalment payments by investors are a major source of financing. However, despite the generally benign situation, we still consider the construction sector to be riskier than other industries. The proportion of insolvencies in the construction sector is higher than in other German trade sectors. According to Creditreform, in 2016 there were 94 insolvencies per 10,000 firms in the construction industry, compared to 42 per 10,000 in the manufacturing sector overall. 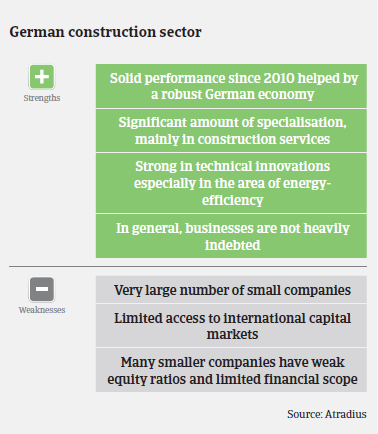 Construction insolvencies still account for about 16% of all business failures in Germany. The poor payment behaviour of public buyers remains an issue, as it puts a strain on suppliers’ liquidity. Many construction companies – especially smaller ones – traditionally have weak equity ratios (the proportion of equity used to finance a company's assets) and limited financial scope, which makes them vulnerable to payment delays and defaults. We have observed higher claims in some segments related to interior work, such as building installation, plastering, painting and glazing. Such activities are usually due at the final stage of building projects, and are therefore more susceptible to budget constraints of the awarding authority. Another reason could be the lack of commercial skills in those mainly very small businesses. Due to the good performance of the German construction and construction materials sector in the last couple of years and the promising business outlook for 2017, our underwriting stance for the industry remains quite relaxed. In general, when assessing buyer risk we take into account operating results, equity, liquidity and financing (e.g. the ratio of work in progress/advanced payments) and orders in hand. However, we are more cautious with the above-mentioned interior work-related segments and businesses that are mainly active for public customers (road and railway and other infrastructure construction). Those often face delayed payments by their clients, which could put a strain on their liquidity. With less background information to work with, we are naturally very cautious when assessing the creditworthiness of construction/construction materials businesses that have operated for less than one year, unless they are part of, or a spin off from, a larger group. While German food exports continue to increase, domestic market conditions have become increasingly difficult. Overcapacity is an issue in some segments.